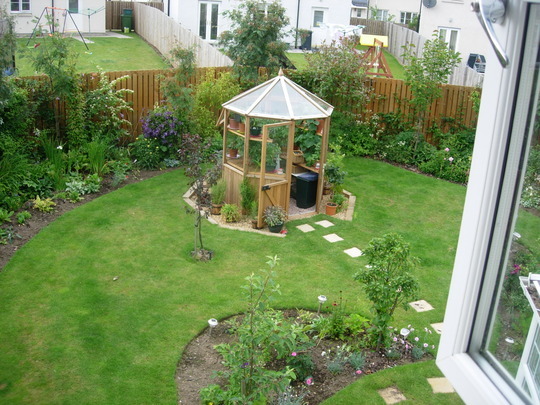 Your green house shape suits the garden. It is a lovely shape, and I like that you have it centralized in a gravel bed extending the space's borders. Thanks! It gives me an opportunity to grow herbs in pots around it! Your garden puts the others to shame ! Thanks Louise, wouldn't it be great if some of these neighbours of mine could understand the joy that comes from growing stuff! lol! Still, they are mostly growing children at the moment so I'll let them off! I do have a very keen gardening neighbour just two doors down who has an allottment and everything and his garden, though north facing, is absolutely lovely so I'm not entirely 'on my own' ! Oh, that's a shame! Thank goodness for GOY! Just compare it to the others there - no contest, Karen should feel very pleased with herself ! Thanks friends! I do think it is a pretty greenhouse and as I had octagonal seating area it seemed right to have octagonal greenhouse! What a super greenhouse, suits your garden perfectly. I love the curves. :~))). It will be great when all those trees have grown. Yes, thanks Skillen...I am not a patient woman.....come on trees! lol Karen - I know what you mean! You'll be surprised how quickly they grow. Thanks for the encouragement! I find that looking at them every single day doesn't help....like watching the kettle! yes indeed Karen thumbs up for this one :-) ! Thanks very much, and a big welcome to GOY! Lovely looking greenhouse and garden.. Thank you Bill, and welcome to GOY! I love it! And I do like the way you have stood it on shingle. I want to have a similar-shaped gazebo in my back garden & have picked out the spot I want to put it ... near a flowering cherry we put in about three weeks ago. I was thinking we would have to make a concrete base for it, but the gravel looks great. Did you dig out the required shape & just pour the gravel in, or did you put down a weed-barrier material & then fill the area with the gravel? I work part-time ... four full duties one week & just two the other week, but as I leave for work at 1.30pm, I do have the mornings to do some light work in the garden. We can hardly wait until we reach retirement age (65 at the present time in NZ) .... it will be put up to 67 soon, but we just slip in for the present retirement age, as just a bit over five years away now. The garden should hopefully be looking quite good by then! Now, let me see if I can remember...the joiner did the work. There were concrete footings with the greenhouse, so all they had to do was level the ground and lay the footings, then mount the greenhouse on top. We dug out the surrounding area afterwards and laid the sleepers, but that was after the greenhouse was finished. The joiner had the gravel laid for me when he put it up. I should imagine that your gazebo will have similar concrete footings included in the pack...perhaps not, but I hope so! They are concreted in I think Dwyllis, but not a solid concrete base. Hope that helps...only thing in the garden that we haven't done ourselves! I want your greenhouse.so jealous.Mines an ugly looking standard glass one.Second hand! This is a special greenhouse to me, as it was bought with money from the will of a dear elderly friend who died about 5 years ago now. For that reason it is called Doris! she would have approved,as she was an artist and her late husband was a dedicated gardener.